What’s in a word? Precious little. We all know that we don’t translate words, or even sentences and paragraphs: We translate content, in all its context. (Worte and not Wörter, for those of you who know German.) And yet, most of us bill our services by the word. Why? And what message does this send? The why is simple: It’s the easiest way to assess the volume of the task and provide a price in advance. And the message? To our clients, it says we are selling a commodity — the very message that, elsewhere, we keep trying to contradict. To ourselves, the message is that the faster we can translate, the more money we will earn. It incentivizes speed, not quality. Moving away from word rates toward hourly or project-based fees better reflects how we actually work — and how we want our work to be perceived. Language is the only barrier to communication in many situations world-wide. However, it is the job of linguists to bridge this gap. In a sense, translators and interpreters can unite the world! What a powerful profession! Their importance is exactly why it is imperative that professional interpreters and translators let their name — and their skills — be known. Whereas translators and interpreters can work in government offices, courthouses, and other locations, many translators work from home, in call centers, or within various large firms found in global arenas. In many of these positions (and others), these persons are found behind a computer. The work-life of translators often offers no assistance for booking new projects. After all, being stuck behind a computer means that personal interaction with new people is a rare occurrence. Perhaps that is why so many are turning to social media or personal online websites. Perfecting an online presence can be brutal, but it is necessary for today’s market. And there is no exception for the professional translator and interpreter alike. So, if you are a translator or an interpreter and you are looking to get your name known in the industry and grow your business, what is the first thing you need? 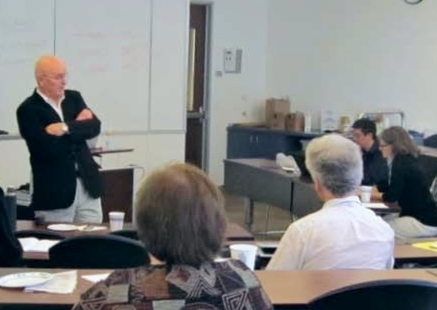 Kermit Clum provided valuable money saving financial tips to seminar attendees. 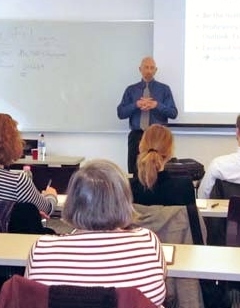 Translators and interpreters got a crash course in small business management and an in-depth tutorial on financial and tax planning for the independent contractor from Kermit Clum. In September, Courtney Searls-Ridge helped NCTA members get an edge on their contract negotiation skills. Excellent language skills are essential for freelance translators and interpreters. To be successful, however, good business skills are also necessary. In addition to marketing and negotiation, linguists are required to understand contracts and accurately assess their content, and this dimension is becoming more complex and challenging. Andrew Crawford led a group of entrepreneurs in a workshop on building their business and their client base.